Maybe this sounds familiar? You’ve installed your Canada Post shipping extensions, but now it’s time to turn them on and get them working. Keep reading for tips and functions to power up the Canada Post features within your Magento store. Within the extension, begin by clicking on Signup with Canada Post – if you already have an account, you’ll be prompted to Sign in – and then follow the steps to link your Canada Post account to the Magento extension you’ve chosen. Once your account is registered, you can configure your extension (you’ll find all the information you need to do this on the same page). Live rates: calculated based on the parcel’s weight, dimensions and destination. Flat rates: set regardless of destination, weight or dimensions. Free shipping: set with minimum order. Need help streamlining your e-commerce shipping processes? Canada Post has a team of e-commerce solution integration experts to help merchants like you. These (estimated) delivery dates are based on the type of shipping service the customer chooses (Expedited, Xpresspost, etc.). Remember to add your in-house fulfillment “lead time” to the calculation fields. You can adjust these numbers for peak season and special offer times. Use these fields to control how your expected delivery date appears on the checkout page. Reduce the chance of a parcel being returned (and an unhappy customer). 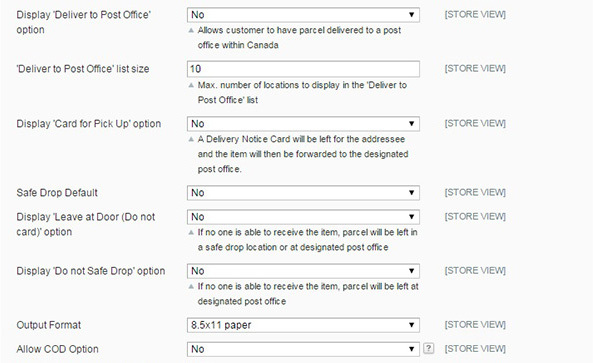 You can choose to have Canada Post send an email notification upon shipment, exception, or delivery of the product.